I've always known that the Athabasca oil sands development was incredibly large. To have a group of very smart people from the Nexus North initiative, dub it "the largest industrial project in the history of humanity" sends a pretty strong message about its scope and scale. To be clear, I've been driving through the heart of this development, back and forth to Fort McKay - a small Aboriginal community that sits just north of Syncrude, for over 15 years. I've seen the contour of the earth alongside the highway change from a cavernous hole to an almost flat landscape in the final stages of getting ready for reclamation. And while this stretch offers up impressive views of large equipment, an expansive mine, and a gargantuan upgrading facility, it truly is only the tip of the iceberg...as I discovered yesterday. Jasmin Herold, a documentary filmmaker from Germany, had invited me along on their aerial tour with McMurray Aviation, a one-hour circle around Fort McMurray, Suncor and Syncrude. It was my first low-altitude tour of the oil sands ever, though I had flown at a much higher elevation and speed many times, while on the way to Fort Chipewyan. I had been above the community about 10 years ago, as Heather had purchased a helicopter flyover at a fundraising event. I can promise you that the amount of change since that flight was off the charts. 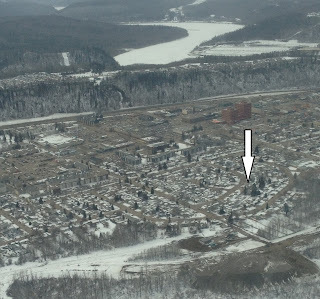 You get a sense of the progress from the highway leading to the airport, but from the air, it is clear that Saline Creek, the next major residential/business neighborhood to come on stream is quickly taking shape. When this area is built out, it will be its own mini-community with all kinds of amenities, quick access to the airport, and an ideal living spot for folks working on the projects south of town. Bridge construction has been happening for so long that I almost don't remember when it was just our two legacy bridges allowing traffic to flow north and south across the Athabasca River. Today, all the traffic uses the unnamed structure that was opened in the fall of 2011, the largest bridge deck in Alberta. Both the Ralph Steinhauer and Grant MacEwan bridges have been under the knife since. The older MacEwan structure had its trestles removed to allow for a complete rebuild of the deck that will curve under the other two bridges to flow on to MacDonald Island and Franklin Avenue, respectively. The Steinhauer has been widened to accommodate three southbound lanes, all connecting directly to Highway 63. 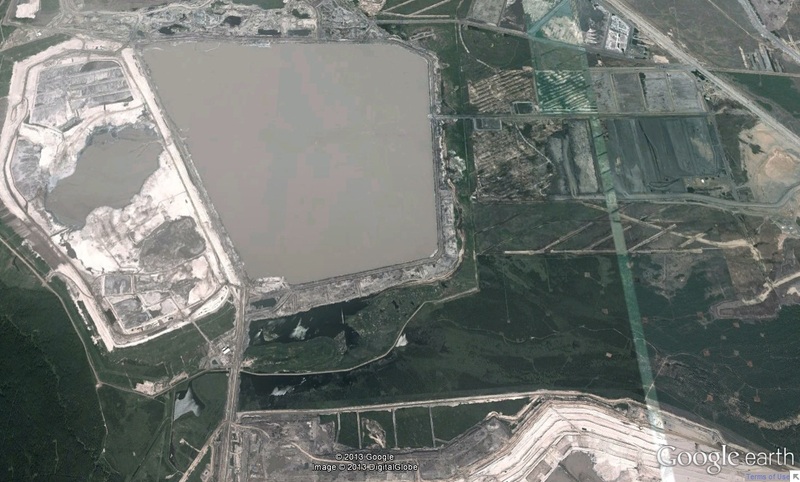 Up until yesterday, I had a very limited perspective of the size of tailings ponds. Flying over Suncor's massive ponds on the east side of the Athabasca River, I was completely struck by their enormity and their many adjacent settling ponds and drying piles, the manifestation their cutting-edge TROTM technology. "Honestly, I'm blown away by the size," I said to all of those on board, through the microphone atttached to the set of headphones I was wearing. "I'm having a different response," replied Jasmin. "To me, it looks like a painting, so many interesting lines and layers." We did a number of circles over Syncrude's North Mine, an expansive open pit excavation that stretches to the horizon, teeming with activity as some of the world's largest trucks and shovels harness one of the richest bituminous sand seams in the world. By this point, my stomach was also going in circles, beginning its protestations that we needed to bet back on terra firma as soon as possible. As we flew home over massive upgraders, several large camps, and countless heavy haulers delivering the feed stock for the ever-hungry processing plants, I began to formulate a new understanding of the true scope and scale of what happens in our region every day, 24-7-365. Key to point out is that this gobsmacking taste I received on a short 60-minute flight was only that, a taste, and a small taste at that. More massive projects to the north - Horizon, Kearl Lake, Jackpine, Albian among them - and many more in-situ operations to the south, getting a comprehensive aerial tour of this unparalleled development would take more time, fuel and money than any of us had. "That's my house," I said to Jasmin, thrusting my finger in front of her face and pointing it to the intersection of Armit Crescent and Demers Drive. This rare excursion was the final scene in my small role in this documentary film that will one day show in Germany, complete with subtitles. I had been interviewed earlier that morning and my participation in the flight would provide some necessary b-roll for the final cut of the film, assuming I don't end up on the cutting-room floor, though it's entirely possible. It took my stomach a couple of hours to stop spinning, but the discomfort was totally worth it, as I gained a fresh appreciation for the activity that is driving the Canadian economy.